Here's a roundup of some events and donation drives benefitting those in need and connecting people with services through the end of the month. The winter weather has brought its near-constant chill to the Inland Northwest, and foster families as well as young people at Excelsior Youth Center are in need of winter coats. To help, the City of Spokane is collecting your donated coats, which don't need to be new, but clean and preferably only lightly worn if used. In part, Excelsior is hoping for coats for their residential youth, who are doing community outreach by volunteering to shovel snow for people with physical disabilities. Specifically, the center is looking for Large and Xtra-Large coats for men, and Medium and Large coats for women. They can be dropped during business hours at the main floor of City Hall. 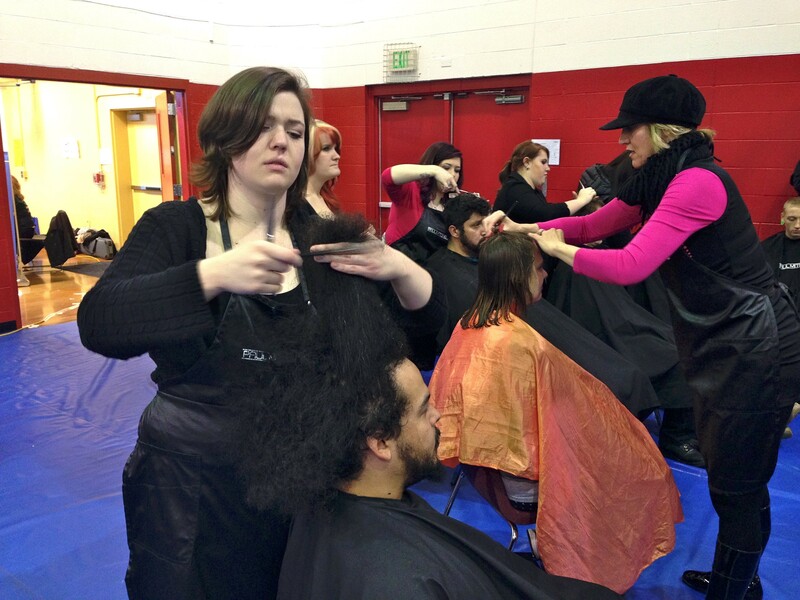 Savannah Mackey gives Hector Ortiz a haircut at Homeless Connect in 2014. For the seventh year, the annual Homeless Connect event will bring together dozens of service providers to offer free health and dental screenings, housing assistance, shelter referrals, benefit assistance, court assistance for people with outstanding warrants, help with getting an ID, and more. Last year, more than 300 people came and got help. The event runs from 10 a.m. to 2 p.m. Thursday, Jan. 25, at the Salvation Army Community Center, 223 E. Nora Avenue. The downtown Spokane Public Library will host the latest screening of local documentary, "A Walk Through Poverty," a half-hour exploration of homelessness and poverty in the Inland Northwest. The film includes portrait sketches of those sharing their stories and experiences, and was produced by SNAP, John J. Hemmingson Philanthropy, and Rogue Heart Media. The showing starts at 4:30 p.m., Thursday, Jan. 25, at the downtown library, 906 W. Main. In advance of Inlander Restaurant Week (Feb. 22 to March 3), you can be the first to find out which restaurants are participating, sample some of the dishes they plan to feature, and sip some wine at the 21-and-over First Bite, which benefits Second Harvest and is co-hosted by the Dairy Farmers of Washington. Sample some cheese and listen to live music by Kyle Richard at the event, which runs from 6 p.m. to 8 p.m., Thursday, Feb. 1, at Barrister Winery, 1213 W. Railroad Ave.